Read for This Week’s Study: Revelation 13, Rev. 17:8, Dan. 7:24, 2 Thess. 2:2-12, Rev. 12:14-16, 1 Kings 18:38. Revelation 12 describes Satan’s attacks against God’s faithful people, including persecution by pagan Rome and later papal Rome during the 1,260 day/years (A.D. 538-1798; see Rev. 12:6, 13, 14 and Lesson 7, Tuesday). Chapter 13 describes in more detail Satan’s attacks during Christian history with the help of two allies, both portrayed as beasts. Under Satan’s direction, the dragon and these two beasts will unite at the end of time to oppose God’s redemptive activities and seek to win the allegiance of the world. A word of caution is necessary. It is easier to interpret prophecies already fulfilled in the past. But when we come to prophecies yet to be fulfilled, as we do in Tuesday’s study, we need to be more cautious. God shows us what will happen at the time of the end so that we will not be surprised, but He does not tell us every detail we would like to know. We must always remember that while these prophecies tell us what will happen at the end, they do not tell us when and exactly how the final events will unfold. We must, therefore, be careful not to speculate beyond what prophecy tells us. Let us not forget that the prophecies of Revelation have practical purposes: to teach us how to live today and to be prepared for the future. Study this week’s lesson to prepare for Sabbath, March 2. Read Revelation 13:1-4, 8 and Revelation 17:8. What are the characteristics of this beast, and what are the phases of its existence? John watches as a monstrous beast rises out of the sea. While a beast represents a political power, the description of the sea beast points to a political power that has religion as a dominant characteristic. The sea symbolizes the largely populated area of Europe out of which the sea beast rises to power after the downfall of the Roman Empire (Rev. 17:15). John describes the beast as it emerges from the water. The beast has seven heads and ten horns, the same as the dragon in Revelation 12:3-4, showing its close connection with pagan Rome. Upon the heads of the beast is a blasphemous name, and upon the horns are royal crowns. The heads of the beast are the kingdoms that Satan has used to persecute God’s people throughout history (Rev. 17:9-11). The blasphemous name points to the divine title the beast claims. The ten horns point to Daniel 7:24, symbolizing the nations that sprang out of the Roman Empire after its demise. These characteristics of the sea beast all point to the papacy that grew out of the Roman Empire. The beast from the sea resembles a leopard with feet of a bear and the mouth of a lion. As such, the beast combines the characteristics of the four beasts (symbols of world empires) in Daniel 7:2-7: Babylon, Media-Persia, Greece, and Rome. However, John lists them in reverse order, which from his first-century perspective shows that the sea beast is related to the fourth beast of Daniel 7, the Roman Empire. The dragon (the pagan Roman Empire empowered by Satan) gave the beast his power, his throne, and great authority. Just as the Father has given His throne and authority to Christ (Rev. 2:27), so Satan invests the beast as his coregent and representative on earth. Revelation 13:5-7 states that the period of the beast’s persecuting activities through Christian history is 42 “months”. As we have seen, persecution of the pure woman lasted for “a time and times and half a time;” that is three and a half “times” or prophetic “years” (Rev. 12:13-14; compare Dan. 7:25). Forty-two prophetic “months” equals 30 days multiplied by 42, or 1,260 days/years (Rev. 12:6). Therefore, “a time and times and half a time”, 42 “months”, and 1,260 “days” all refer to the same time period of 1,260 years. This phase ends when John sees “one of his [the beast’s] heads as if it had been mortally wounded” (emphasis added). The subsequent healing of this “deadly wound” points to a time after 1798 when the beast would be revived and its power restored. The healing of the deadly wound draws the admiration of the world, and they worship both the dragon and the beast. Revelation 13:5 specifies a time period of persecution that we talked about in yesterday’s study. The 42 months of the beast’s activities is the same time period as the 1,260 days/years of the persecution of the woman/church in Revelation 12:6, 14. (A prophetic day symbolizes a year [Num. 14:34, Ezek. 4:6]. See Tuesday’s study in Lesson 7). The year A.D. 538 marks appropriately the beginning of this prophetic period when the Roman church, with the pope as its head, established itself as a church-state power that dominated the Western world throughout medieval times. The events of the French Revolution inflicted the deadly wound upon the beast in A.D. 1798, thus bringing the church’s oppressive rule and the state-empowered religion to a temporary end. The sea beast’s activities during the prophetic 1,260 days/years are stated in terms of blasphemies. In the New Testament, blasphemy can denote a claim of equality with God (John 10:33, Matt. 26:63-65) and the action of usurping His authority (Mark 2:7). The sea beast’s blasphemies are directed “against God, to blaspheme His name, His tabernacle, and those who dwell in heaven” (Rev. 13:6, NKJV). The dwelling of God is the sanctuary in heaven, where Christ ministers on behalf of our salvation. The sea beast seeks to negate Christ’s mediatorial work by attempting to replace it with a human priesthood that claims to administer salvation and the forgiveness of sins. Assuming these powers that belong only to God is the essence of blasphemy. Revelation 13 points to a time of major apostasy in Christianity, which was fulfilled when Roman Catholicism claimed the position and authority of God with the pope as its head. Those who refused submission to Rome experienced persecution and martyrdom. Although today such statements are viewed as harsh, even bigoted, the present cannot erase the history, no matter how much some people wish that it would. How can we stay faithful to prophecy about church history and yet, at the same time, be kind and cautious as we present these truths to others? The first half of Revelation 13 describes the Roman Catholic power active during the prophetic period of 1,260 days/years. With the events of the French Revolution, this religio-political system received a deadly wound. However, the mortal wound will eventually be healed, restoring this system to life. The second half of the chapter describes how the healing of the sea beast’s deadly wound actually will happen. John observes the emergence of another beast. Unlike the first beast, the second beast arises out from the earth. This second beast is a world power, with influence of the same caliber as the first beast. However, in contrast to the sea beast, which had a terrifying appearance, the earth beast appears harmless, at least at first. It has “two horns like a lamb” (Rev. 13:11, NKJV). This lamb beast is a symbol for Christ. Thus, this end-time power appears to be Christlike. This power arises in territory that protected the woman, a symbol of God’s true church, from the dragon’s persecuting flood at the conclusion of the 1,260 days/years (Rev. 12:14-16). This earth beast is obviously a new player on the scene, having arisen as a world power after the sea beast received the deadly wound during the events of the French Revolution, which means the earth beast is exclusively an end-time player. “What nation of the New World was in 1798 rising into power, giving promise of strength and greatness, and attracting the attention of the world? The application of the symbol admits of no question. One nation, and only one, meets the specifications of this prophecy; it points unmistakably to the United States of America”. - Ellen G. White, The Great Controversy, p. 440. Revelation 13:11 shows, however, that America, largely Protestant, will eventually start speaking like the dragon, like the devil himself, with a worldwide influence similar to the Roman Empire. This end-time power will be instrumental in making the whole world worship the first beast, which received the deadly wound. In other words, the United States, which at one time had provided protection and a haven for the church, at some point will play a persecuting role in last-day events. When the United States was first identified as the second beast of Revelation 13, it had nowhere near the power and influence it has now. How does this fact help affirm the identification of the United States as the power depicted in this prophecy? Read Revelation 13:12-13. How do 1 Kings 18:38 and Acts 2:3 help us understand the nature of the lamblike beast’s deceptive activities - the greatest of which is bringing fire down from heaven? By working miracles, the lamblike beast will convince many that its words are true despite not being in full harmony with Scripture. “Through the agency of spiritualism, miracles will be wrought, the sick will be healed, and many undeniable wonders will be performed”. - Ellen G. White, The Great Controversy, p. 588. These miracles help the lamblike beast to persuade the inhabitants of the earth to make an image to the sea beast that received the deadly wound. The healing of the sea beast’s deadly wound refers to the restoration of the Roman papacy as a religio-political power. The lamblike beast will also begin speaking like a dragon and exercising the power of the sea beast, showing that it will become as intolerant as the nations represented by these symbols. ‘Saying to them that dwell on the earth, that they should make an image to the beast’. Here is clearly presented a form of government in which the legislative power rests with the people, a most striking evidence that the United States is the nation denoted in the prophecy. But what is the ‘image to the beast’? and how is it to be formed? The image is made by the two-horned beast, and is an image to the beast. It is also called an image of the beast. Then to learn what the image is like and how it is to be formed we must study the characteristics of the beast itself - the papacy. The ‘image to the beast’ represents that form of apostate Protestantism which will be developed when the Protestant churches shall seek the aid of the civil power for the enforcement of their dogmas”. - Ellen G. White, The Great Controversy, pp. 442-445. Revelation 13 indicates that the lamblike beast will have the leading role in the final crisis. This world power will establish a global system in an attempt to control the beliefs of people. This system will mirror medieval Christianity under papal control. Read Revelation 13:16-17 along with Deuteronomy 6:4-8. What does putting the mark on the right hand or the forehead have to do with the commandments of God? People of all social classes will be pressured to receive the mark of the beast on their right hands or their foreheads. Just as the seal in the forehead identifies those whom God regards as His (Rev. 7:3-4; Rev. 14:1), so the mark of the beast identifies the worshipers of the beast. The mark of the beast is not a visible sign of any kind. Its placement on the right hand or on the forehead counterfeits the instruction Moses gave the Israelites to bind God’s law as a sign upon their hands or their foreheads (Deut. 6:8). The right hand has to do with behavior, while the forehead has to do with the mind or mental agreement. Some will choose to receive the mark of the beast to escape the threat of death, while others will be fully committed mentally and spiritually to this apostate system of worship. The central issues in the final crisis will be worship and obedience to God in keeping His commandments (Rev. 14:12). The Sabbath commandment in particular, will be the test of faithfulness and obedience to God. As the Sabbath is the distinctive sign of the obedience of God’s faithful people (Ezek. 20:12, 20), so the mark of the beast is the sign of allegiance to the beast. The mark of the beast involves the substitution of a human commandment for God’s commandment. The greatest evidence of this fact is the humanly established institution of Sunday (Dan. 7:25) as the day of worship instead of the seventh-day Sabbath, the day mandated in Scripture by our Creator. The attempt to change the sign of God’s authority to another day is an attempt to usurp the role and power of God Himself. “The mark of the beast is the papal sabbath. … When the decree shall go forth enforcing the counterfeit sabbath, and the loud cry of the third angel shall warn men against the worship of the beast and his image, … then those who still continue in transgression will receive the mark of the beast”. - Ellen G. White, Evangelism, pp. 234, 235. Revelation 13:18 (NKJV) says: “Here is wisdom. Let him who has understanding calculate the number of the beast, for it is the number of a man: His number is 666”. Who is this man? Paul describes him as “the man of sin” (2 Thess. 2:3). This designation points to the papal power symbolized by the sea beast, whose blasphemous name on its heads points to the divine title it claims for itself, supposedly standing in the place of the Son of God on earth. Further Thought: Revelation shows that the Sabbath will be a sign of obedience at the end of history. We have to remember, however, that a person’s observance of Sunday now does not itself mean that he or she has the mark of the beast. Sunday keeping will become “the mark of the beast” only when, having clearly understood the issues involved in choosing a day of worship, despite the deceptions out there, people make their choice either for or against God. However, that time still lies in the future. “No one has yet received the mark of the beast. The testing time has not yet come. There are true Christians in every church, not excepting the Roman Catholic communion. None are condemned until they have had the light and have seen the obligation of the fourth commandment. But when the decree shall go forth enforcing the counterfeit sabbath, and the loud cry of the third angel shall warn men against the worship of the beast and his image, the line will be clearly drawn between the false and the true. Then those who still continue in transgression will receive the mark of the beast”. - Ellen G. White, Evangelism, pp. 234, 235. Let us remember that Sunday observance today does not make a person lost any more than Sabbath observance makes a person saved. The time is coming, however, when “the mark of the beast” will become the central issue and when choosing a day of worship will be the test of faithfulness. Revelation appeals to God’s people to take the Bible and, with a heart-searching spirit, study the prophetic word for themselves and make every effort to reach with the gospel those who are today unreached for Christ. As you observe the situation in the world today, what trends do you see in the religious and political spheres that seem to be leading toward the fulfillment of the prophecy of Revelation 13? As we await the end, what should be our attitude toward Christians in other denominations? Think of the following counsel: “Our ministers should seek to come near to the ministers of other denominations. Pray for and with these men, for whom Christ is interceding. A solemn responsibility is theirs. As Christ's messengers we should manifest a deep, earnest interest in these shepherds of the flock”. - Ellen G. White, Testimonies for the Church, vol. 6, p. 78. In our attitude toward Christians in other denominations, how can we avoid manifesting a superior attitude or an un-Christian spirit? How are we to show respect for them and their personal faith without compromising our beliefs? Mordecai Msimanga turned to God and became a missionary to his fellow Zimbabweans after accidentally hearing a sermon from the Song of Solomon. 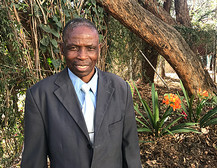 As a young man, Mordecai was baptized into the Seventh-day Adventist Church in Rhodesia in 1963 and moved to the country’s second-largest city, Bulawayo, to find work. He stopped praying and reading the Bible. “I became a stubborn person who ran away from the church for 22 years”, he said. During those years, he became a soldier and fought in Zimbabwe’s war for independence. After independence in 1980, he lived for himself and refused to consider God. One day, he decided to buy a cow. The seller, however, was attending an Adventist camp meeting, so Mordecai went to look for him. Arriving at the camp meeting field, he learned that the seller had left for a short time, so he sat down on the ground to wait. The preacher was reading from the Song of Solomon, and the words cut Mordecai to the heart. “Take us the foxes, the little foxes, that spoil the vines: for our vines have tender grapes”, the preacher read from Song of Solomon 2:15 (KJV). He said the foxes were gobbling up the Israelites’ crops and God was permitting this because the Israelites were stubbornly refusing to repent and obey Him. As Mordecai listened, he realized that he also faced destruction if he stubbornly refused to repent and obey God. “I was the same as the Israelites who ran away from God”, he said. He remembered the many times that God had protected him in the past. He had gone to war and returned without a single injury. His sins seemed enormous. Mordecai began to sob. He couldn’t contain his grief as the tears rolled down his cheeks, and his weeping turned into loud cries of anguish. “I understood that I was a sinner in front of my God”, he said later. Mordecai stood up and, crying loudly, walked up to the stage. The preacher halted his sermon and immediately made an altar call. Dozens of people, touched by the tears of the hardened military veteran, came forward to give their hearts to Jesus. Mordecai, 68, has worked since 2006 as a Global Mission pioneer, a missionary who spreads the gospel among his own people in unreached areas. He has cast out evil spirits and converted an entire church of 16 people, including the pastor. Mordecai praised God that his plan to buy a cow collapsed. “The Spirit of God led me to sit and listen, and I thank God for that”, he said.